Idioms are curious things in any language. If something isn’t supposed to be difficult, someone will say, “Hey, it’s not rocket science.” The root canal finds itself in this same realm, but in a much more dubious way. People say things like, “Oh, that movie was awful, it was like having a root canal,” or, “The only thing more painful than that meeting would be a root canal.” It is generally assumed that a root canal is an extremely arduous procedure dentists only perform in the basement of their office, where they keep a variety of torturous drills that were originally bought at the hardware store. The truth is that a root canal in Ocala, FL is now a very regular procedure, so dentists have decided to keep the medieval torture out of it. These days they are no more painful than a regular check-up. He will take x-rays to fully assess the state of your tooth. Despite lacking its inner structure, a tooth can still maintain itself inside the mouth. Further restoration may be needed in order to assure the tooth’s longevity, such as a crown. More Importantly, Does It Hurt? A root canal is a non-surgical procedure that is performed regularly by dentists around the country. It is in their best interest to make sure you are calm, relaxed, and experience no pain during the process. No one would come in for a root canal otherwise. The area Dr. Weldon will work on will be thoroughly anesthetized so you only have the faintest idea of what is actually happening. Most root canals take about 30-60 minutes, with extreme cases taking up to 90. Nonetheless it is all done in one visit. We must emphasize again that no matter the length or depth of your root canal, you will be entirely numb to the sensation. 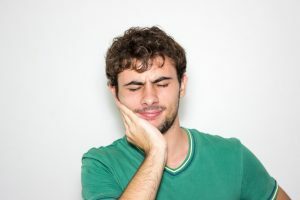 The only discomfort may be afterwards in the form of sensitivity in the repaired tooth. If you are experiencing any sensitivity or extreme pain in your teeth and gums, you might be in need of a root canal. The best way to be sure is to make an appointment with us today so we can give your teeth a thorough examination. Should you need a root canal, there is no need to fear. You can rest easy that whatever pain you are feeling before the procedure will be the only pain you feel.